When you first install iTunes for Windows, it will automatically start downloading un-downloaded content as soon as you login to your iTunes account, or associate your Apple ID with it by authorizing that computer. This will also happen if your iTunes Store settings are set to check for new downloads (you can disable automatic downloads). This tutorial only covers PCs, running Windows 7, Windows 8 / 8.1, or Windows 10 - a future Mac tutorial will come. 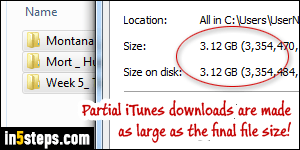 To make sure that your computer has enough hard drive space before starting the download, iTunes will "pre-create" the files with a size matching that of the fully downloaded file. That's why you see a jump in space used right away! By clicking on the downloads icon and clicking Pause Downloads at the bottom (screenshot), you can stop the current downloads. iTunes never downloads more than three files in parallel: if you stopped the downloads soon enough, you'll only have three partial downloads. But a standard definition TV show is over 500 megabytes in size; with three TV shows starting to download in parallel, you're already talking about 1.5 gigabytes in disk space usage! First, exit iTunes, to release the "lock" in places on ongoing download files. 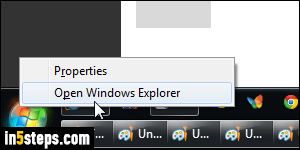 To delete the partial file downloads, open Windows Explorer (hold down the Windows logo key and hit E, or right-click on the start button and click Open Windows Explorer). Select Libraries in your favorite folders links, and double-click on Music on the right: that's where iTunes saves its files. Then, navigate your way to the iTunes > iTunes Media > Downloads subfolders.